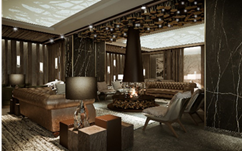 Italian Hospitality Collection is delighted to announce plans to open Le Massif, a luxurious five-star ski hotel, and La Loge du Massif, a slope-side, destination restaurant with kids club set apart from the hotel, in the Italian ski resort of Courmayeur in December 2018. Contrastingly, La Loge du Massif bar and restaurant at Checrouit will be an enchanting mountain chalet located in the heart of the ski slopes, ready to welcome skiers in for morning drinks, lunch, après ski and dinners. The surrounding slopes provide a range of pistes to suit all abilities, while high-adrenaline activities including heli and para-skiing will delight thrill-seekers. Year round, world-class hiking, golfing and cycling are ideal ways to switch off, get fit and enjoy the scenic landscape. Le Massif will be well set-up for families looking for a care-free holiday, with two all-inclusive packages available for children. Little VIPs will enjoy exciting days both outdoors and in the two mini-clubs at the hotel and La Loge. Animators will ensure children are constantly entertained, whether taking part in activities that combine learning and play, during moments of rest or at lunch and snack time. Welcome gifts and children’s menus are the icing on the top to ensure an unforgettable family holiday. Αναρτήθηκε από geop στις 4:41 π.μ.